Full (Sunday-Tuesday) conference registration for current EEASC members. To check your membership status, log into your eeasc.org account and click on "View Profile" in the upper right-hand corner of the screen. Questions? Contact Chanda Cooper at (803) 576-2084 or cooperc@rcgov.us. Full (Sunday-Tuesday) conference registration for non-members. 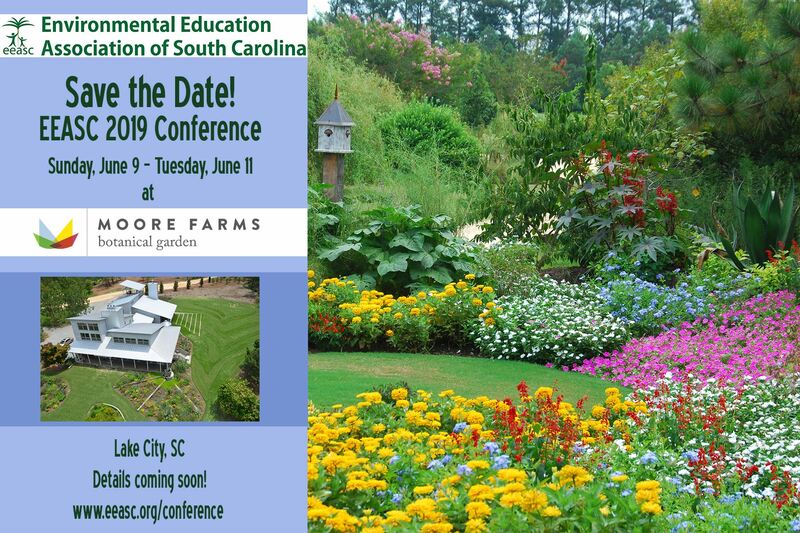 Save $15 by purchasing your individual membership before registering for the conference at www.eeasc.org/Become-A-Member! Full (Sunday-Tuesday) conference registration for conference presenters. Does not include EEASC membership. Full (Sunday-Tuesday) conference registration for full- or part-time students at any school, college, or university. Does not include EEASC membership. Monday Only Registration includes Monday continental breakfast, keynote, concurrent sessions, lunch, awards dinner, and evening social. Does not include EEASC membership. Rooms in the conference block start at $99/night. Call (843) 394-2100 to reserve your room. Cabins ($60/night Sunday-Thursday), RV (hook-up) sites ($20/night), and camping (non-hook-up) sites ($10/night) are also available at Lynches River County Park (20 minutes from Moore Farms). Visit the Park's website for details. Conference registration includes all meals on Monday and continental breakfast on Tuesday. Some optional Sunday workshops include lunch. Other meals will be on your own. Insects, Spiders, and Ticks--Oh, My! Add a conference t-shirt to your registration for $15! Many thanks to the 2019 EEASC Conference Sponsors!